Take a step off the beaten path as you venture into the enchanting landscapes of Namibia. Open, empty spaces punctuated by desert wildlife are the menu here. Endless, beautiful deserts blend dramatically into the Atlantic Ocean, creating some of the world’s most unique, windswept coasts and habitats for Africa’s animals. Desert species that can’t be found anywhere else in nature are strewn across the Namib and Kalahari Deserts alongside Africa's Big Five. Let the bucket listers have the well-trodden, tourist-y destinations, Namibia is for dreamers and explorers. 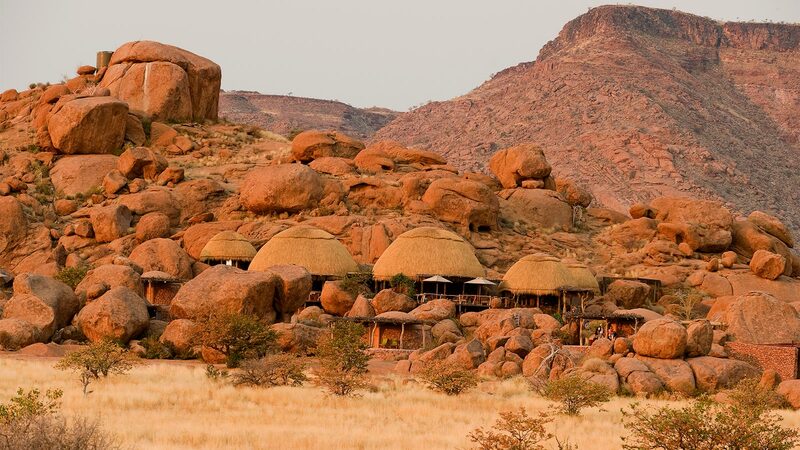 Namibia's diverse landscape showcases some of the most unique lodges found on this planet including the Sossus Dune Lodge, Camp Kipwe, Onguma Tree Top Camp. These three camps are featured in many of our Namibia safari itineraries and are ideal basecamps for Namibia explorations. 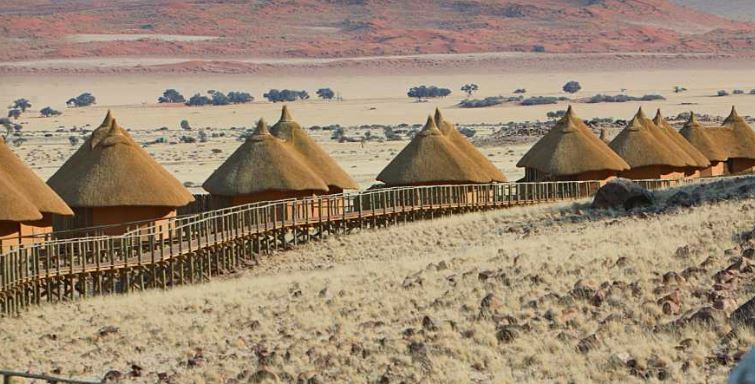 Located within the Sossusvlei National Park, the 23 desert chalets constructed out of locally sourced wood canvas and thatch are laid out to feel like a typical village giving you a great basecamp to explore the wonders of the national park. Activities include sunset game drives, guided nature drives and exploration of the Sesriem Canyon. Nestled in a rocky formation overlooking the Aba Huab valley, each of the nine room at Camp Kipwe offers a secluded and well appointed environment invoking the feeling of being one with the natural surroundings. As you embark on open air vehicle safaris, immerse in the knowledge of local guides to learn about the landscapes, traditions, geology, botany and wildlife as you venture into a unparalleled safari experience. Experience one of Namibia's bush from a different perspective as you sleep in the treetops in the Onguma Game Reserve. 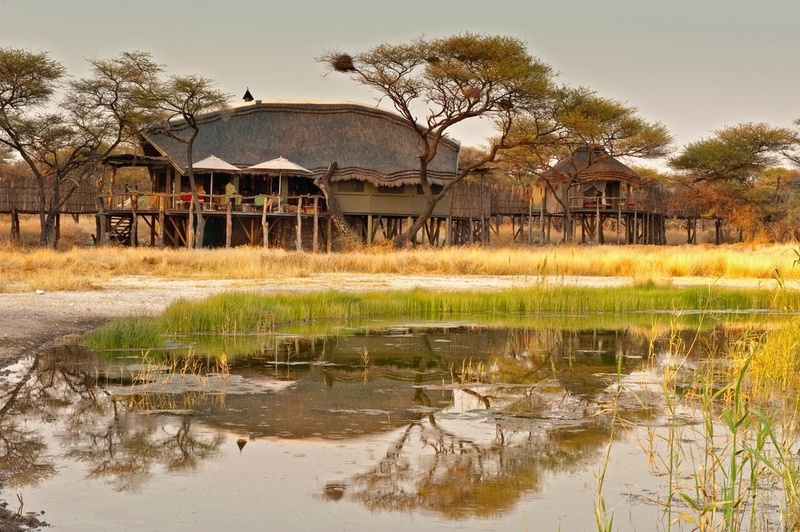 Each of the 4 thatched rooms offer views of one of the most beautiful watering holes in the park allowing for ideal wildlife viewing including giraffe, zebra, lion and an array of antelope species as they come to satisfy their thirst. These three lodges in Namibia are just a taste of the wonderful accommodations you can find within this stunning, off the beaten path safari destination. Visit our Namibia tours page for other sample itineraries or click on the start planning button below to connect with on of our Namibia Travel Specialists today.